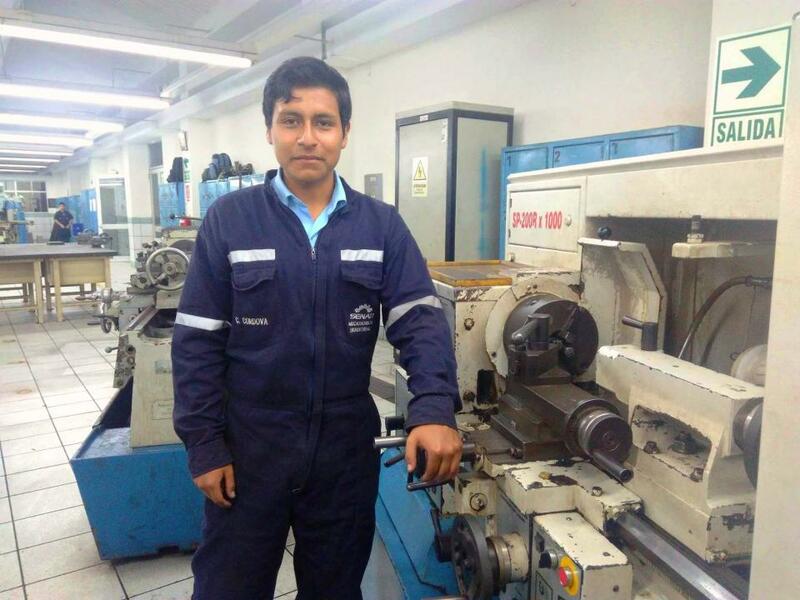 A loan of $6,000 helped to continue and finish his studies in industrial mechatronics. Cristhian lives in Lima with his parents. His father is an informal shoemaker, and his mother is a housewife. He decided to study in the program in industrial mechatronics in SENATI because every since he was very young, using the latest generation of equipment has always captured his attention. He now needs two years to finish his program and thus be able to work in a big industrial business. Nevertheless, neither Cristhian nor his parents has sufficient economic means to cover the cost of his education. For this reason, he is applying for financial support from Kiva to finish his studies and become a professional qualified in the industrial field. He feels very grateful that there are people who support education in the world, especially who support the career that he is so passionate about, which is one of the best experiences of his life. Cristhian says goodbye with this message: "To continue with my studies is part of the goal that I have set for myself. Thank you for helping me to complete my dreams." Translated from Spanish by Kiva volunteer Pam McMurry. View original language description. Cristhian vive en Lima con sus padres, su padre se dedica a la zapatería informal y su madre es ama de casa. Decidió estudiar en el SENATI la carrera de Macatrónica Industrial, ya que desde muy joven le llamaba la atención la utilización de equipos de última generación. Actualmente le faltan dos años para finalizar la carrera y así poder trabajar en una gran empresa industrial. Sin embargo, Cristhian ni sus padres cuentan con los medios económicos suficientes para cubrir los costos de pensiones. Por ello, solicita el apoyo de KIVA a través del financiamiento para terminar sus estudios y convertirse en un profesional calificado en el ámbito industrial. El se siente muy agradecido que existan personas que apoyen la educación en el mundo, sobretodo que apoyen la carrera que tanto le apasiona, siendo una de las mejores experiencias de su vida. Cristhian se despide con este mensaje “continuar con mis estudios es parte de las metas que me he trazado. Gracias por ayudarme a cumplir mis sueños". It helps low-income students attain top-notch degrees and jobs in their field. This loan is structured on Kiva.org as a bullet-loan, or featuring only a single payment at the end of the loan term. Kiva's partner IPFE offers students an optional grace period and flexible repayment schedule, as their capacity to repay is limited and often unpredictable during the course of their studies. This means that although this student client is likely to make a number of small, gradual repayments over the course of his or her loan term, Kiva and IPFE are unable to project when exactly these will occur. Therefore, although these payments have not been factored into the repayment plan on Kiva, you will likely be reimbursed for a portion of this loan before the bullet payment at the end of the loan term. IPFE is a non-profit organization that was created to provide affordable credit facilities for students who want to gain access to quality higher education. IPFE benefits from a solid reputation with high profile personalities on its Board, which ensures solid ties to both the public and private sector in Peru. IPFE seeks to expand its student loan portfolio by providing loans to the low-income population with the aim of securing jobs in the thriving technical industry. This will consequently lead to stronger economy and a lower unemployment rate in Peru. Kiva shares IPFE’s long-term goal of expanding its geographical outreach while continuing to target low-income student populations. IPFE aims to issue loans to students of low-income social classes, who would otherwise not have access to higher education. For developing economies such as in Peru, the need for qualified technical employees is high. IPFE strives to generate economic growth. With Kiva’s support, IPFE can develop a new student loan product that will target low-income students who wish to enroll in various technical programs.